His resignation request will reach parliament on 12 April. Ukrainian Prime Minister Arseniy Yatsenyuk has resigned. "I have decided to step down as prime minister of Ukraine. On Tuesday, 12 April, the motion will be submitted to the Supreme Council [parliament]. There are several reasons behind my decision. The political crisis in the state has been unleashed in an artificial manner. Politicians were blinded with the desire to replace one person and this has paralyzed their will to bring about true changes in the country. The process of replacing the government has turned into mad jogging in place. The authors of the crisis have fallen hostage to circumstances and turned every one of us hostage: the government, society and the state," he said in the address to the people of Ukraine, which was published on 10 April. He made a special point that his People's Front faction would remain in the parliamentary coalition and called on MPs to accept his resignation request. "The Petro Poroshenko Bloc faction has nominated Volodymyr Hroysman for premier. Having done everything for the stability and succession of the course, I am announcing my decision to have my duties and responsibility as head of the Ukrainian government over," he said. Yatsenyuk described his performance as diligent. "This government is the best in the history of Ukraine. Both two recent governments were unique. They were the harbingers of a new Ukraine," he said. "From now on, I see my task broader than simply the powers of the head of government. New electoral law, constitutional reform, judicial reform, coalition control over the course of a new government. 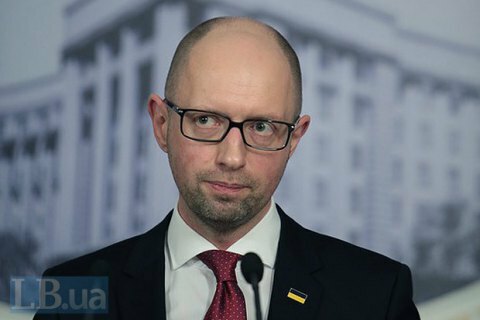 International support for Ukraine's membership of the European Union and NATO – these are parts of my programme," Yatsenyuk said. Arseniy Yatsenyuk headed the Cabinet of Ministers from 27 February 2014. In July 2014, he tendered his resignation, which was turned down by parliament. On 27 November 2014, the post-election parliament formed a new government with Yatsenyuk at the helm.